Wire EDM (Electronic Discharge Machining) is growing in popularity as a precision, cost-effective machining technique. Wire EDM cuts materials with electric current. A piece of wire is suspended between two electrodes in a tank of dielectric fluid; current running through the wire melts through the material creating the desired shape. Wire EDM is extremely versatile with multi-axis controls that can cut complex shapes using CNC programing. 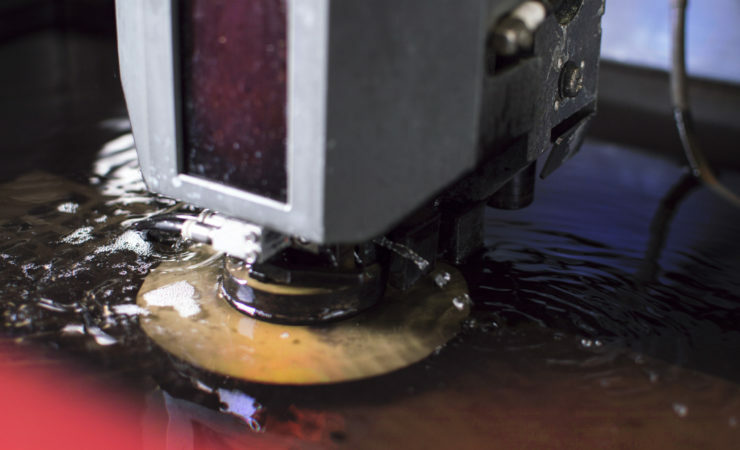 Traditional machining methods of grinding, milling, and lathe cutting cause a lot of wear to machine tools, but with no cutting force used, wire EDM is ideal for tool and die making using hardened steel up to 500mm thick. Wire EDM is a highly efficient process, requiring only one pass to create the desired object, instead of the three or four required by other machining methods. Laszeray employs four Mitsubishi MD Pro Wire EDM machines in our CNC Production Machining department. What this means for customers is that Laszeray is capable of creating advanced mold shapes for complex products, even out of hardened steel required for durable molds meant for long-term, high-volume production. Wire EDM provides a key capacity in helping our customers realize their goals by providing the capability to create complex tooling for advanced product designs, as part out of our unique product development and precision manufacturing capability.